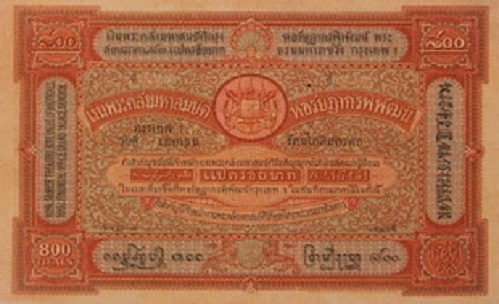 1 Baht ordinary number VF about 135,000 - 143,000 baht. 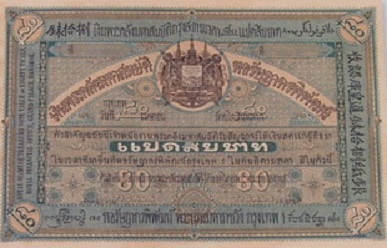 5 Baht ordinary number UNC about 95,000 - 100,000 baht. 10 Baht ordinary number VF about 66,000 - 70,000 baht. 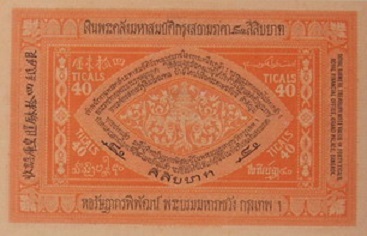 40 Baht Fancy number 12345 UNC about 1,200,000 - 1,250,000 baht. 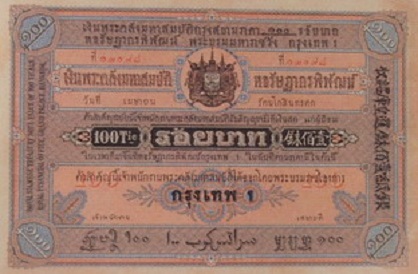 400 Baht ordinary number UNC about 1,200,000 - 1,250,000 baht. 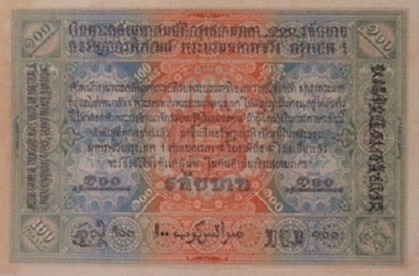 800 Baht specimen drilled "MUSTER" VF about 1,830,000 baht. 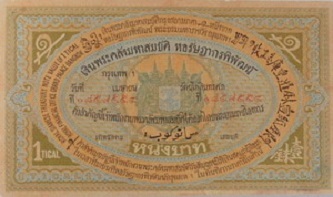 100 Baht specimen drilled "MUSTER" VF about 850,000 baht. 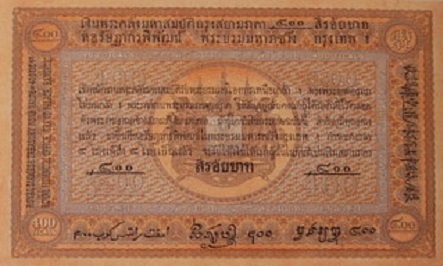 40 Baht specimen drilled "MUSTER" EF about 710,000 baht. The price was updated on 26th December 2017. Ngeon Kradad Luang can be word by word translated in Thai ; Ngeon = Money, Kradad = paper, Lunag = royal. 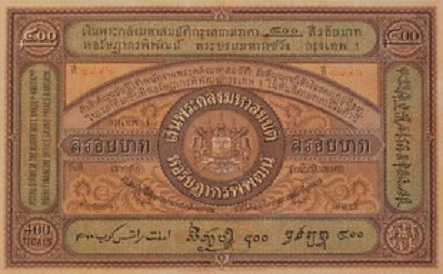 While the foreign banknotes were used among the foreign bank's clients in Siam. 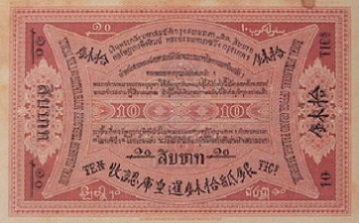 the government tried to solve the shortage of money media by ordering the Giesecke & Devrient Company in Germany to print Ngeon Kradad Luang and these notes arrived in 1892. But These notes had never launched into circulation. 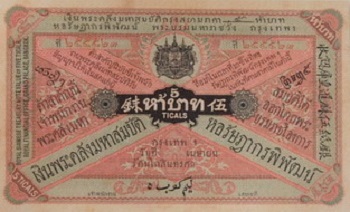 It was assumed that due to the result of a conflict between Siam and France. 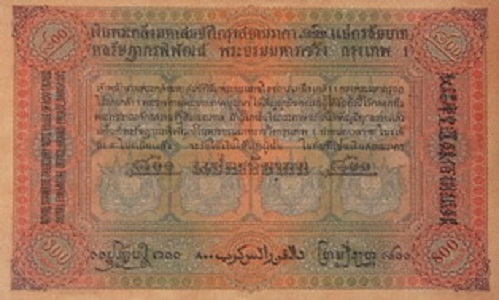 Siam had to cede the far eastern territories (the left bank of the Khong River) to france and also had to pay compensation of 3,000,000 francs. 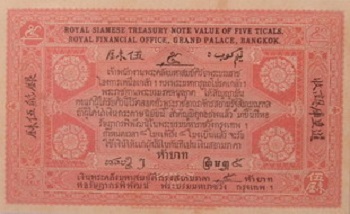 It affected to the reserved value for the treasury notes because of the large sum paid to France. The government destroyed those notes to prevent of lost, but kept only a small number of them to retain as samples. 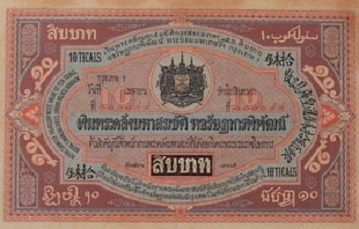 There were initailly eight denominations, 1 Baht, 5 Baht, 10 Baht, 40 Baht, 80 Baht, 100 Baht, 400 Baht and 800 Baht. 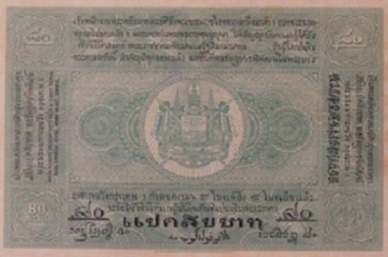 Each denomination had its own colorfully designed style but there were many elements had the same pattern such as the royal insignia in the middle of the front side notes, the value inscription in six languages, Thai, English, Chinese, Malay, Laotian, Cambodian. 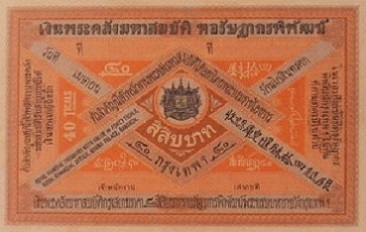 The back side of 40 Baht denomination and higher notes printed the royal emblem on the Ayarapot (three-headed elephant) and also had the portrait watermark of King Rama V at the middle and the denomination both in Thai numeral on the right and Arabic one on the left.